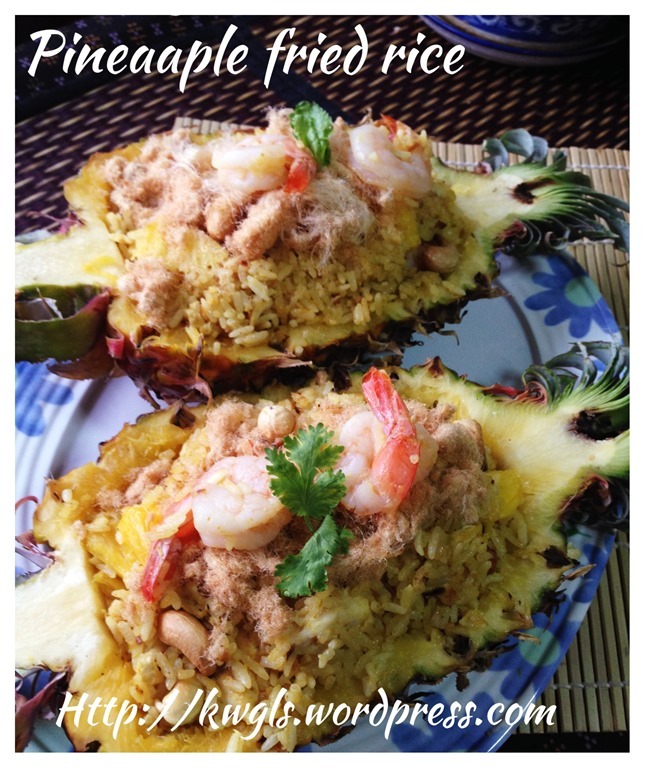 I am looking at the pineapple shell that I made yesterday for my Khao Phat Sapparot or Thai Pineapple Fried Rice. After the dinner, I am supposed to throw them away but I have kept it for one night and still rather unwillingly to throw it away. The reason is that it takes me sometime to “dig” out these nicely shaped pineapple shells.. I am preparing this dish in a rush, really in a rush, started at about 6.00pm yesterday only after I issued my yoghurt marble cupcake. I have to get ready the food within 1 hour (including preparing all the ingredients, cutting of pineapples and stir fry the rice). Of course not forgetting time captured the images for the post… and some hungry stomachs were waiting for my food. Luckily I have cooked the rice, defrosted my chicken, prawns in the afternoon, and that have speeded up the entire process. The images in the post were less than satisfactory…I am tired, hungry after I prepared the dish and I couldn’t take any more pictures as they were all gobbled up in our stomachs. I knew it was definitely unfair for me to ask hungry stomachs to hold on and wait for my picture taking. 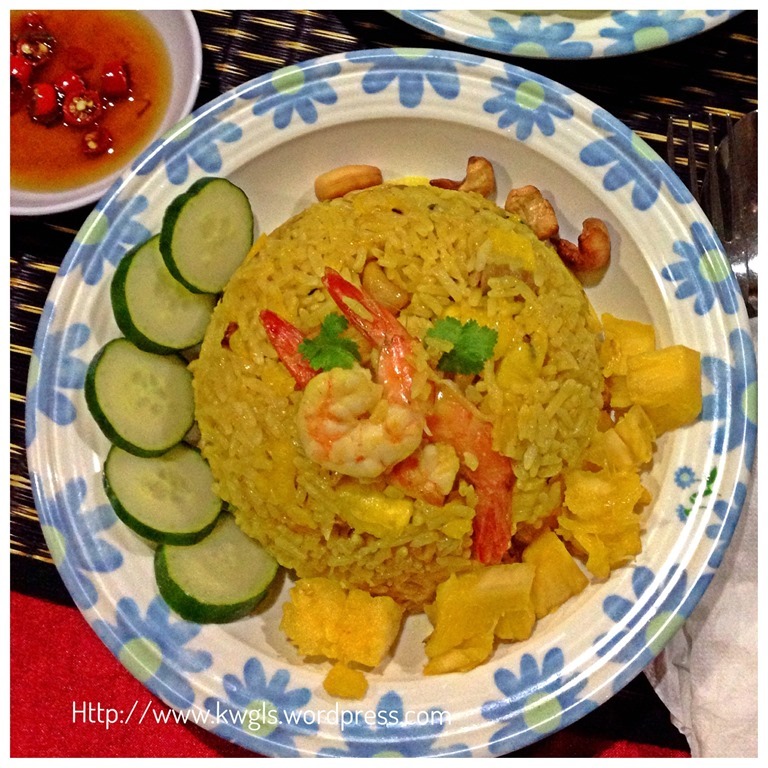 I grew up with white rice, pineapple, turmeric (kunyit) powder, fish sauce, cashew nuts in Malaysia……. 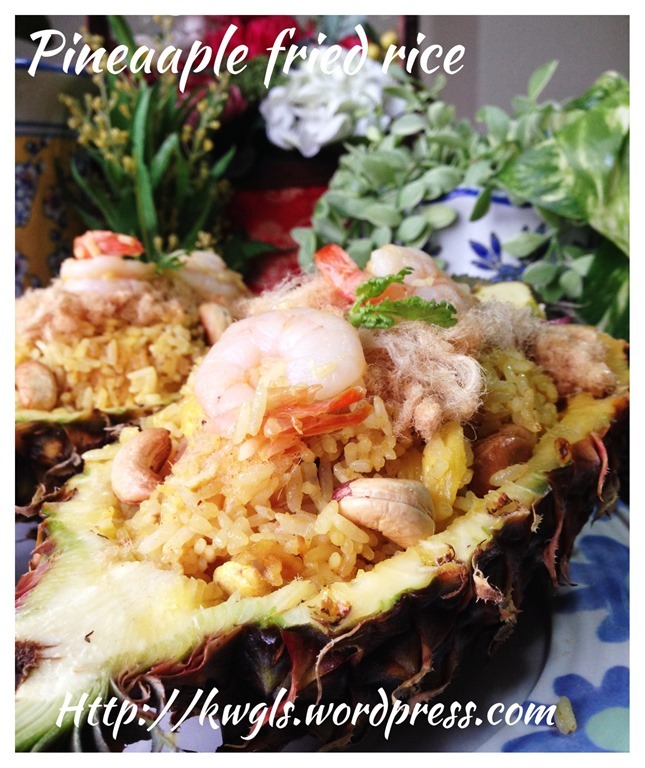 But I am unsure why PINEAPPLE FRIED RICE is considered as an authentic Thai cuisine. Probably because of its unique presentation. 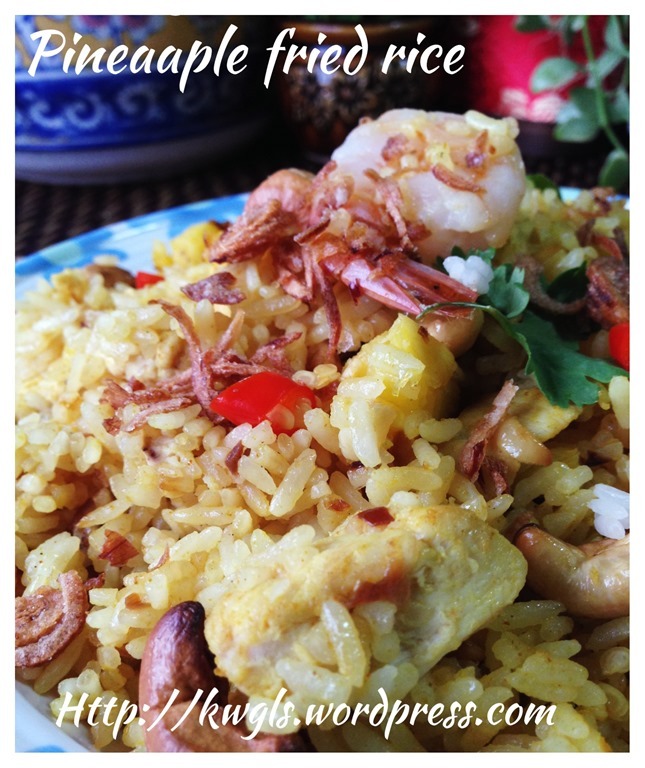 I did not have my fair share of pineapple rice until I travelled to Kuala Lumpur in mid 1990’s. 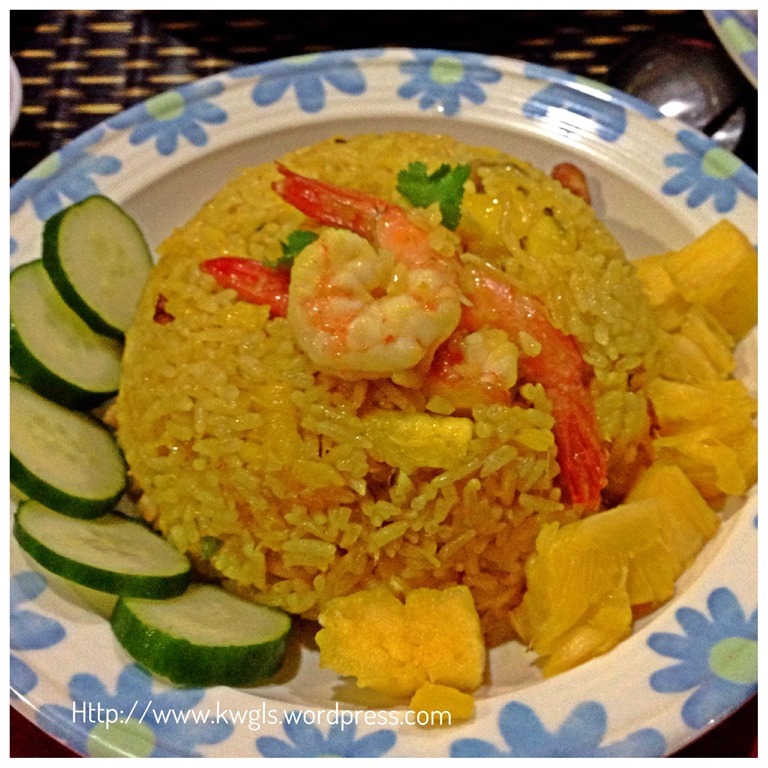 Since then, I had always watched out for this unique rice dish whenever I dined in Thai restaurants. As there are constant supplies of pineapples in Singapore and Malaysia with very reasonable prices, in this illustration, I have used fresh pineapples. For international readers, if you are not living in a tropical country, feel free to substitute the pineapples with canned pineapples. However, in my humble opinion, I found that this special fish sauce is important in the fried rice as the fragrance of the fried rice changes almost immediately after you add the fish sauce. The sauce is rather salty, therefore, any cooking that uses fish sauce shall not use any more salt or light soya sauce for seasoning. 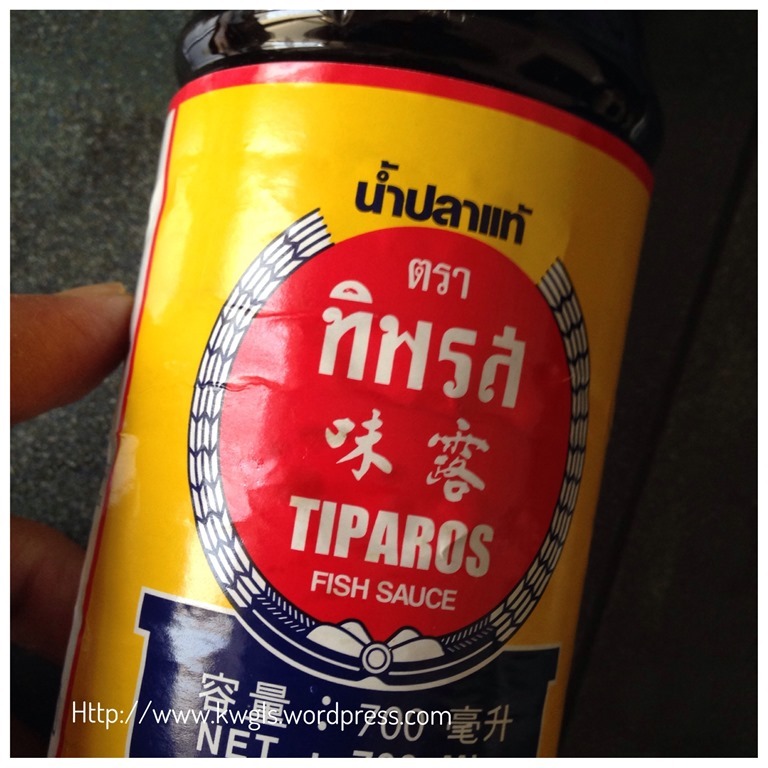 In another word, fish sauce is a substitution for light and dark soya sauces. 1-2 pineapples or 1 can of pineapples cubes. Wash the Thai Jasmine rice and put it in a container to let it cool adequately. If there are time, chill in the fridge. 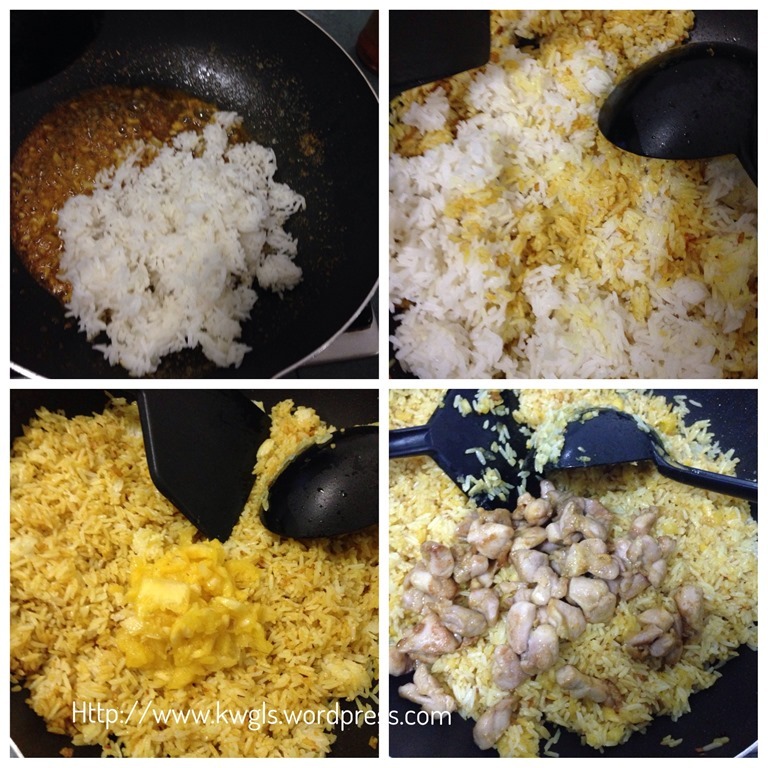 If you wish, use 1/4 cup less of water to cook the rice. For example, my normal rice requires 1 cup of water to cook 1 cup of rice, therefore, for this illustration, I have cooked 3 cups of rice using 2.75 cups of water. The main reason is to have a nicely shaped and not lumpy rice. Any uncooked rice will continue to be cooked in the stir frying process. 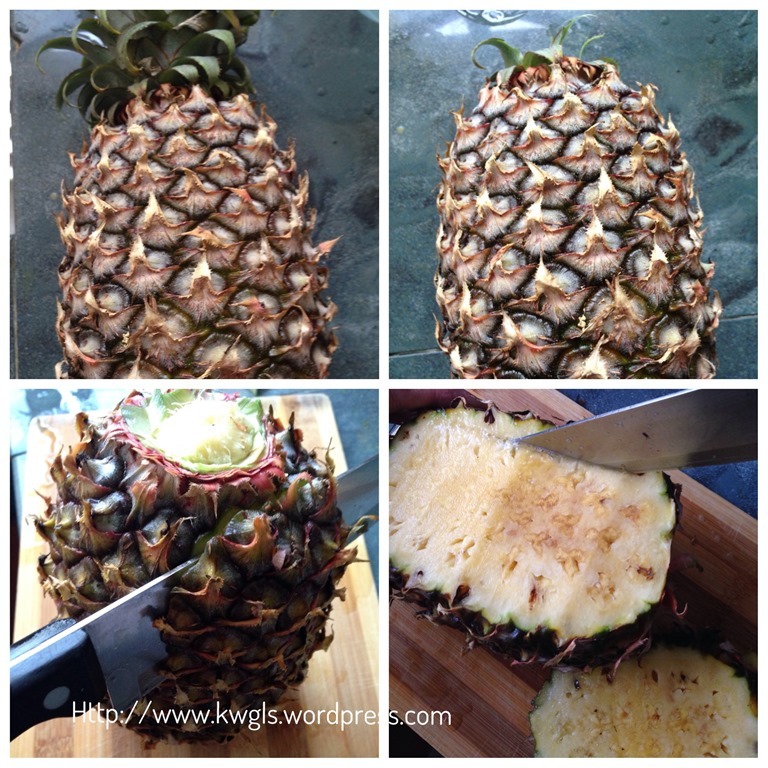 Slightly wash the pineapples and “pull” or cut the head away. 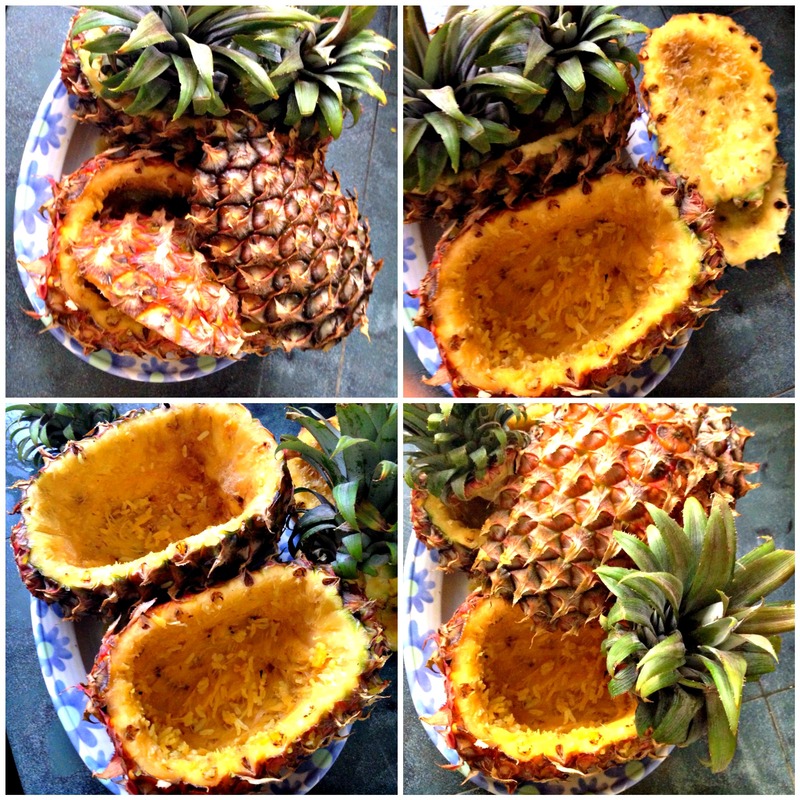 Use a sharp knife to cut open the pineapple and used the knife to cut around the inside of the pineapple flesh following the shape of the pineapple “casing” as closely and as deeply as possible. But make sure the knife will not go through the skin to the other side. It is rather unusual to wash pineapple before de-shelling, however, for this dish, I will think that it is a must because there are lots of dirt and at time, some white powdery things stick to the skin. 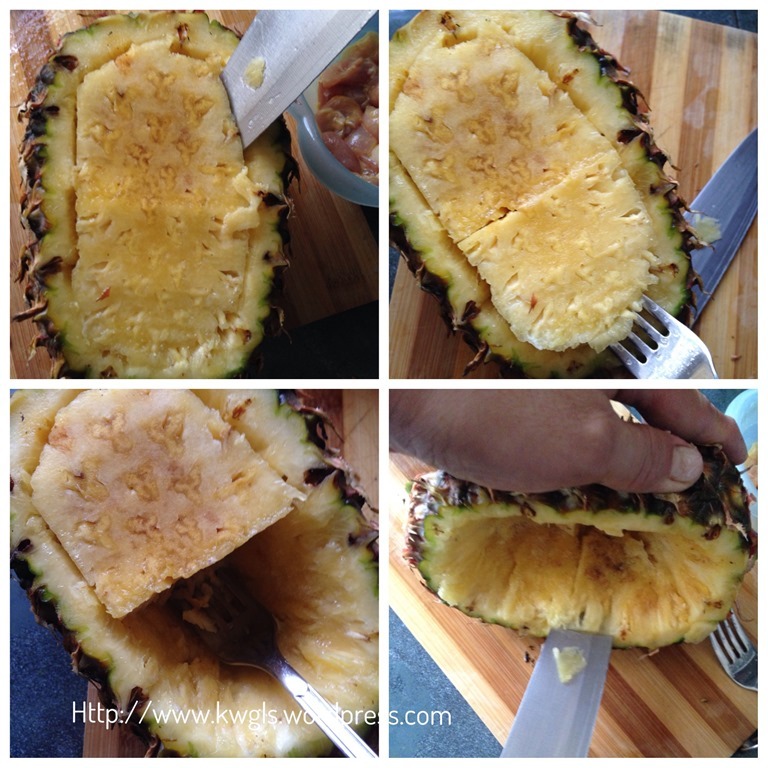 When you perform the cut out, all the dirt may stick to your pineapple flesh causing it to look dirty and unsightly. Cut across the centre and use a knife or spoon or fork to take out the flesh and set aside. As there be quite a lot of pineapple flesh left attached with shell, you can use a smaller knife to cut the remaining flesh around the shell again. As these are the remaining flesh attached to the shell, it may become very small pieces with lots of pineapple juices. 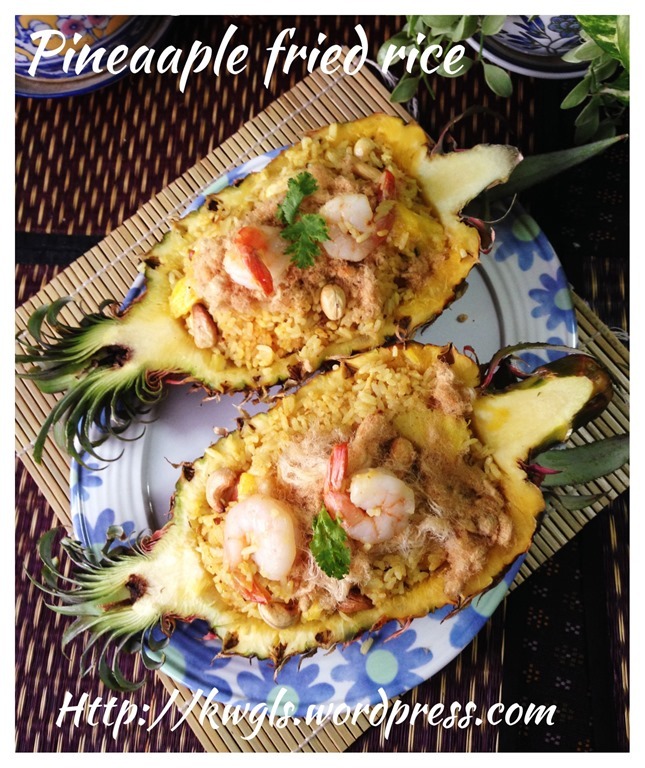 Chopped or minced and keep aside the juices and minced pineapple. 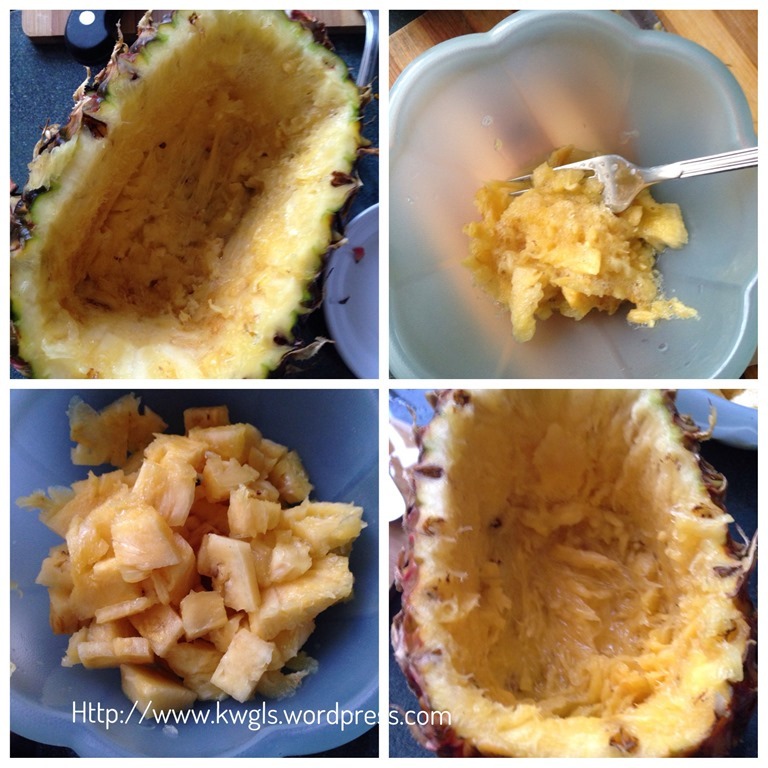 As for the big piece pineapple, cut into a 1 cm x 1 cm x 1 cm cube and set aside. 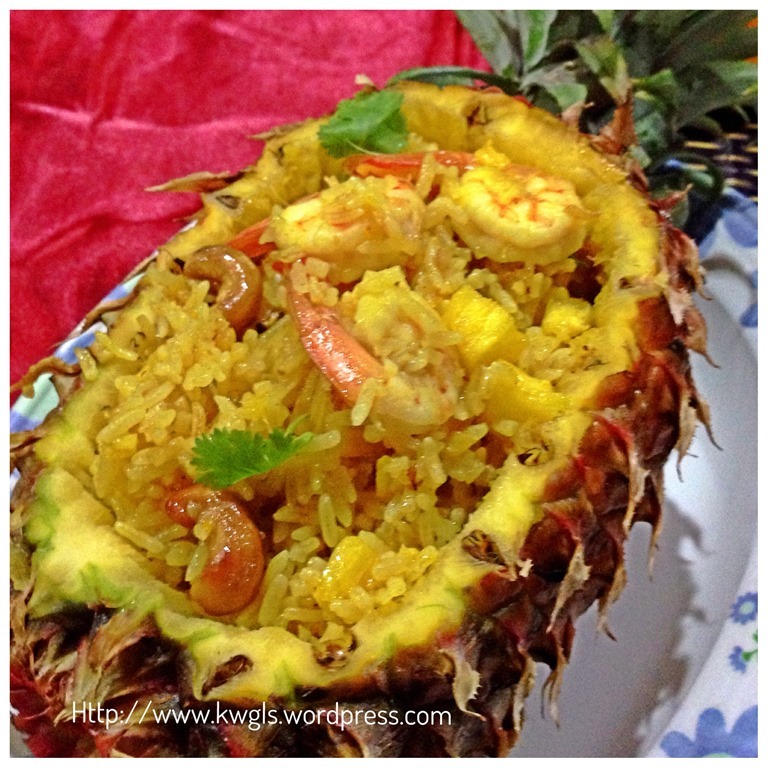 At the end, you should have a rather deep pineapple shell or pineapple boat to serve the rice. Marinate the chicken breast meat with some turmeric powder, half of the corn flour, some white pepper, drips of sesame oil (optional) and marinate for about 15 minutes. 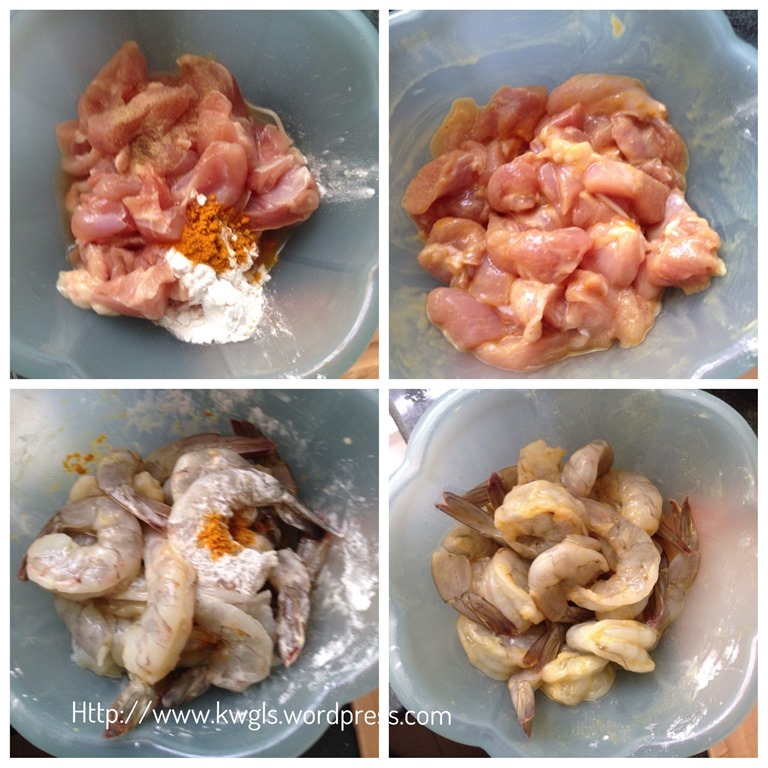 Use the same way for marinating the prawns. Set aside for next step. Have 1 cup of cooking oil in the frying pan, put the cashew nuts in the cold oil. 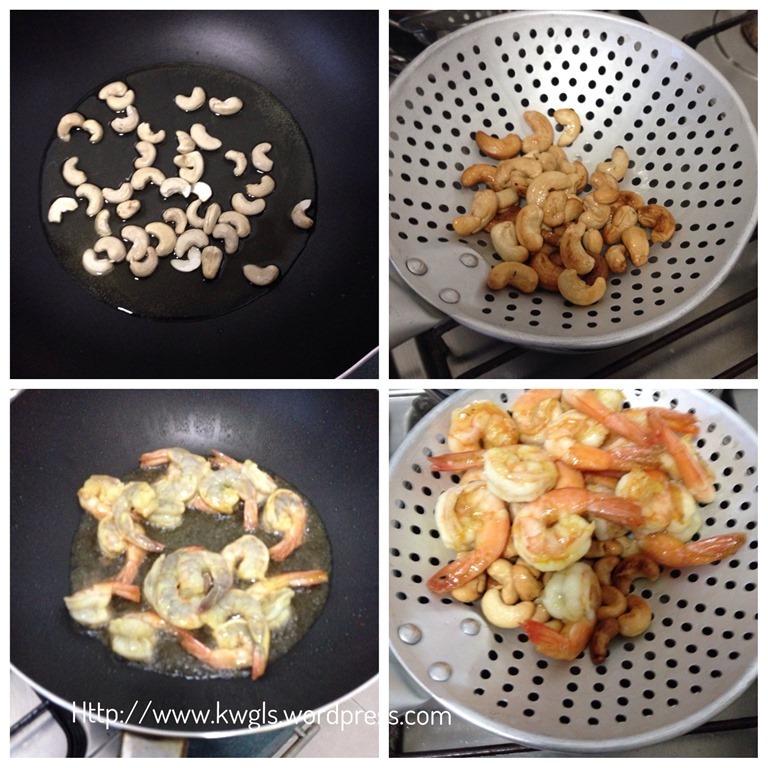 Heat the oil under medium heat and stir fry the cashew nuts in oil until the cashew nuts is golden. Drain and set aside for later use. Note that this is a relatively fast process (about 1-2 minutes) and you have to have a close watch on it. Use the same oil to blanch the prawns. 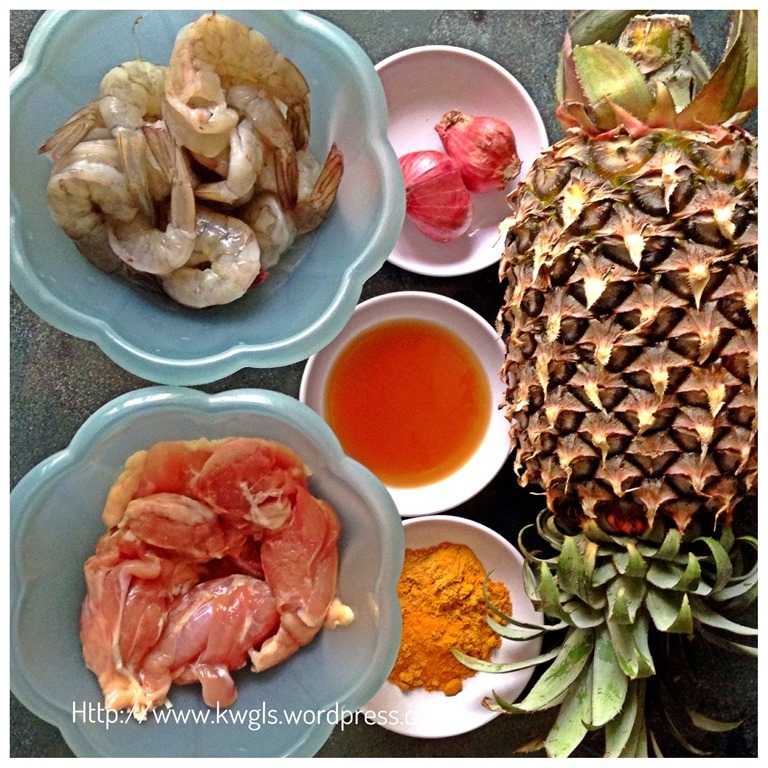 Oil blanching of prawns will took approximately 1-2 minutes when the oil is hot. The prawns will continue to be cooked in the stir frying process later. Drain and set aside. 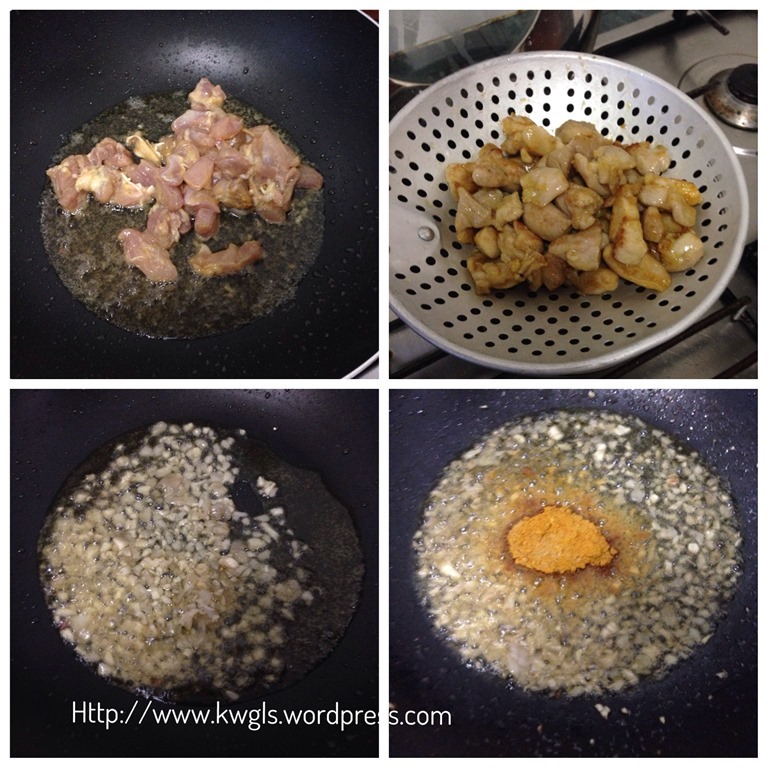 Use the same oil to oil blanch the chicken cubes. Blanch for 2-3 minutes, drain and set aside. Pour half of the oil to a bowl and use the remaining half of the oil to stir fry the chopped shallots until fragrant and start to turn brownish. Add turmeric and coriander powder and stir fry for 1 minutes. Add the rice, stir fry for a few minutes or until the rice are evenly coated with the turmeric powder. 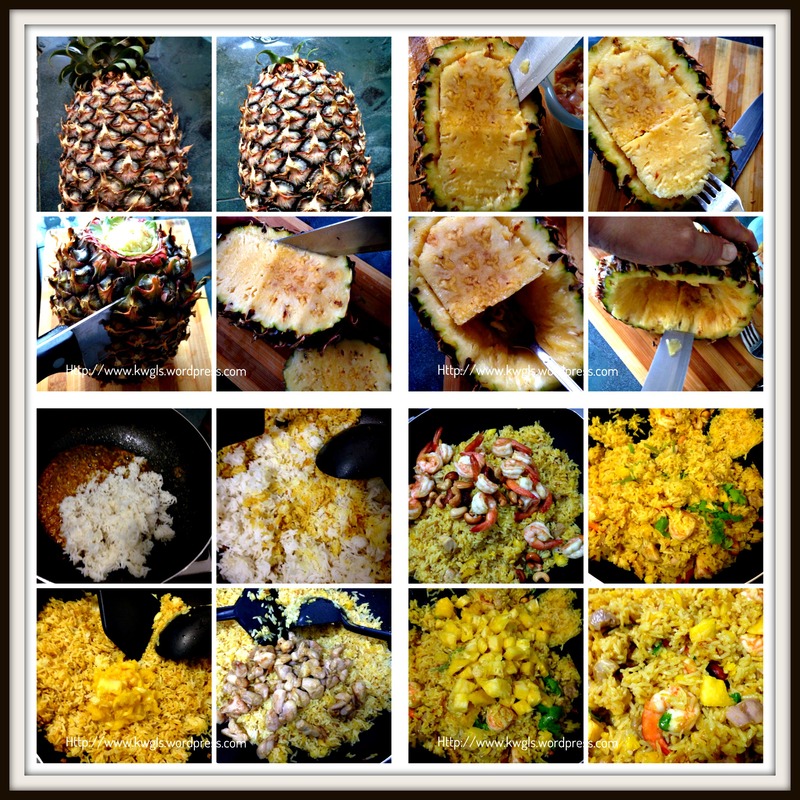 Add in minced pineapple and the juices, followed by the chicken cubes. Stir fry for 2-3 minutes. Add in the prawns and cashew nuts, fish sauces and chopped coriander leaves. Stir fry for 1-2 minutes. 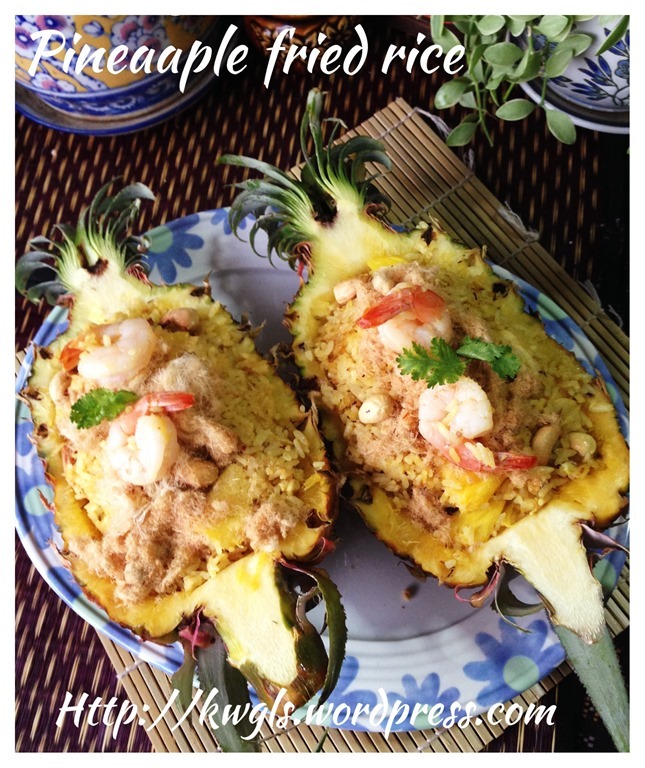 Add in pineapple cubes and stir fry 1-2 minutes. 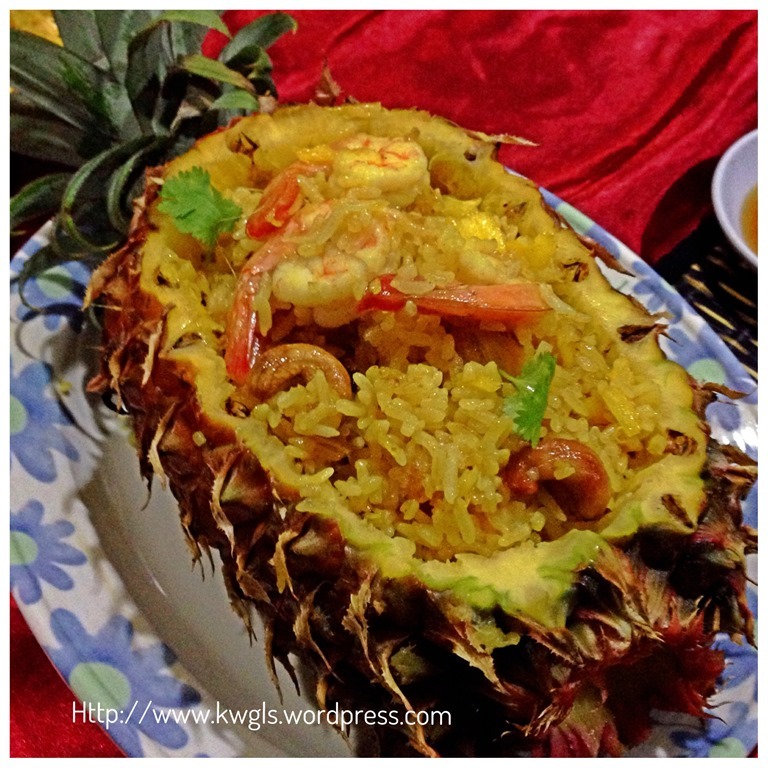 Off the heat and transfer the fried rice to the pineapple shell. Best served hot with freshly red cut chilli or bird eye chilli dip in fish sauce. 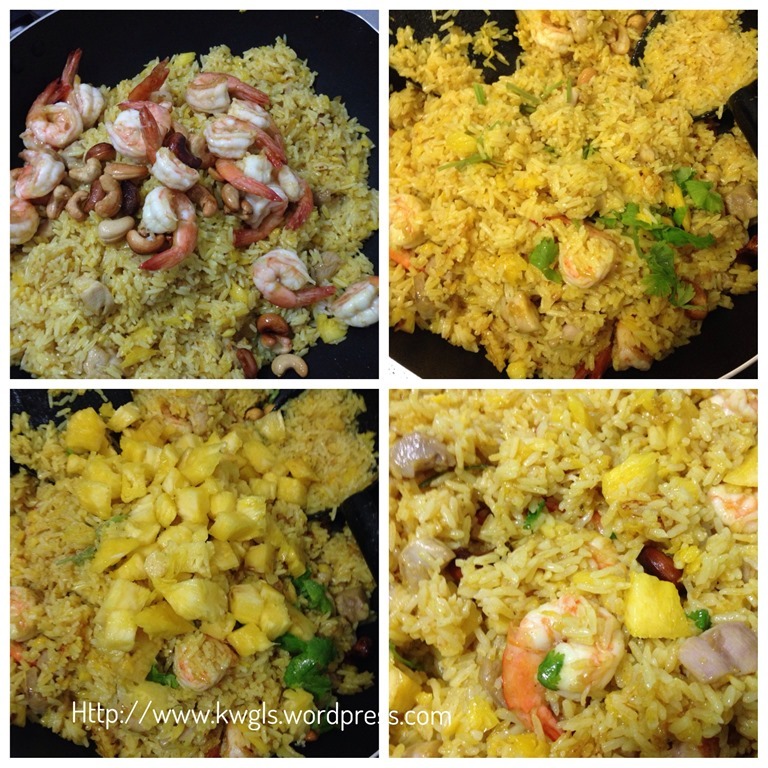 You may have noted that there are no other flavour enhancer used in the fried rice. 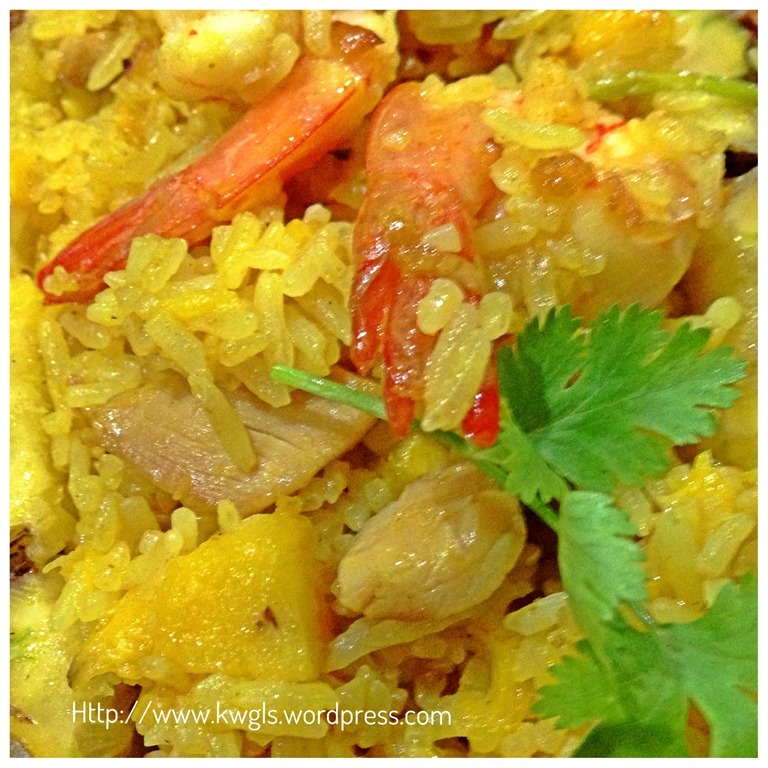 Fish sauces and curry powder, in my humble opinion play critical parts in the whole rice dish to create a difference in taste with other fried rice. 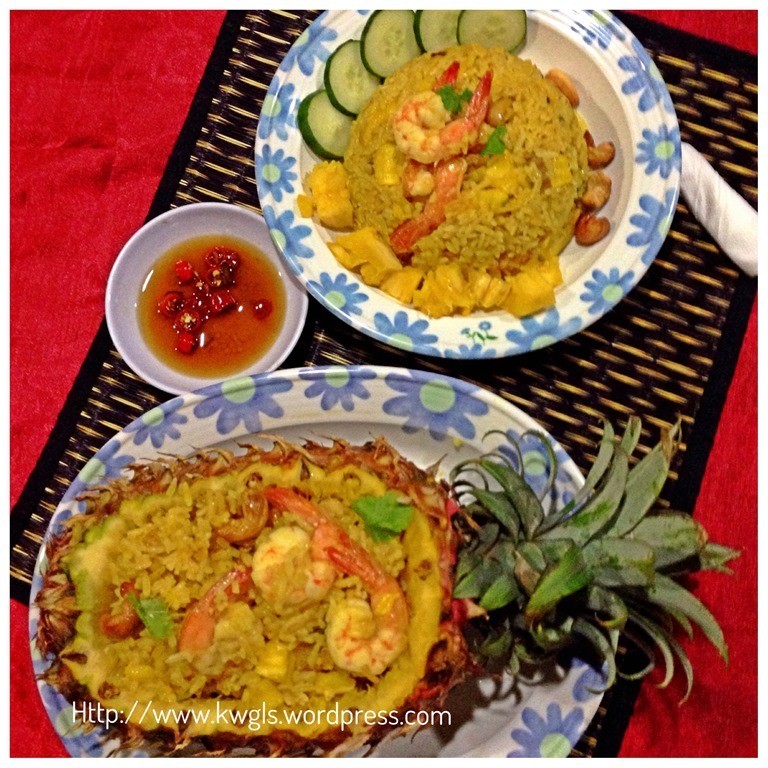 The pineapple cubes and pineapple juices have helped to sweeten the rice. 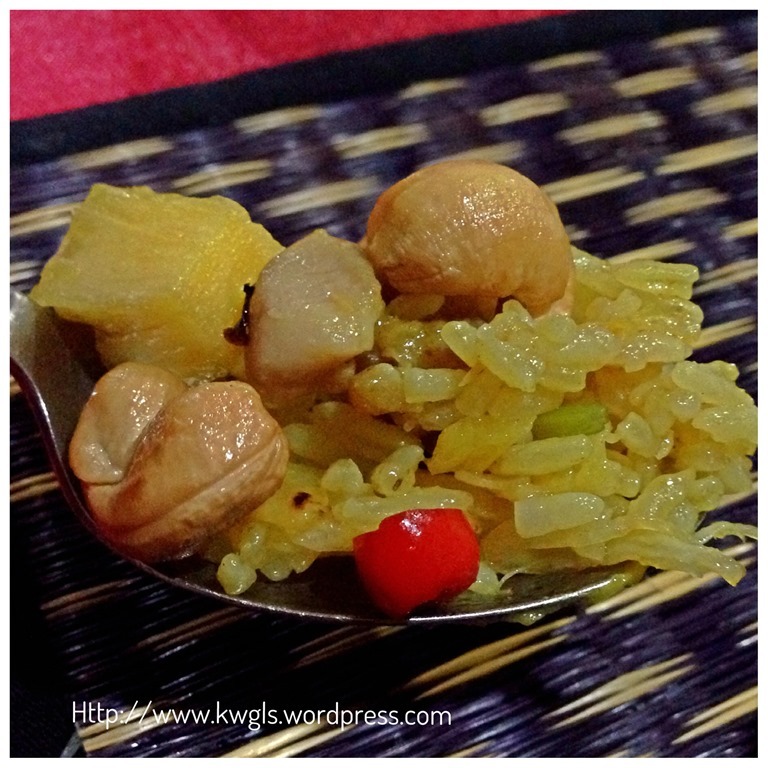 The fried rice should not be lumpy but grainy and yellowish. 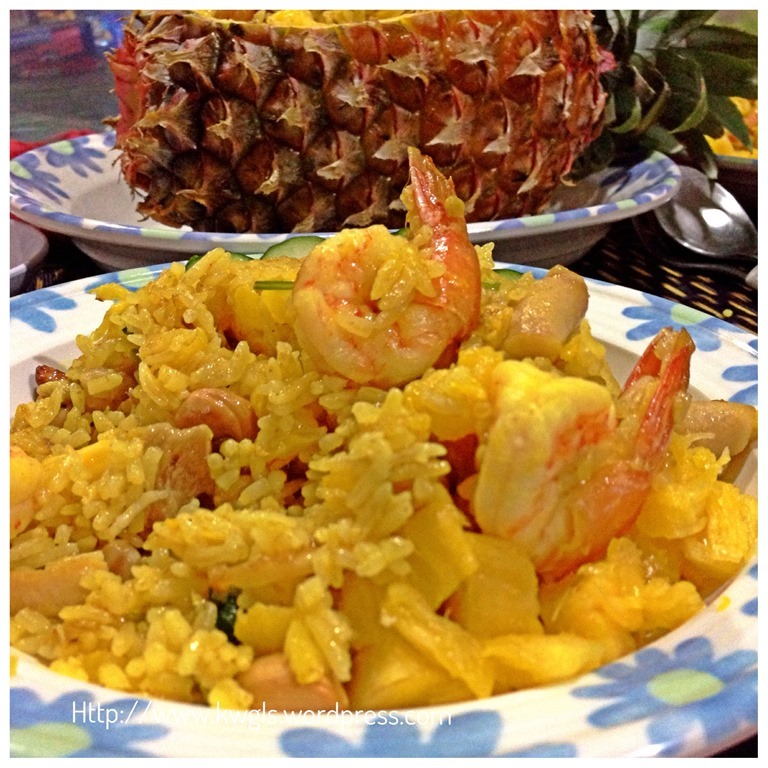 The pineapple juices will also help to moisten the rice. 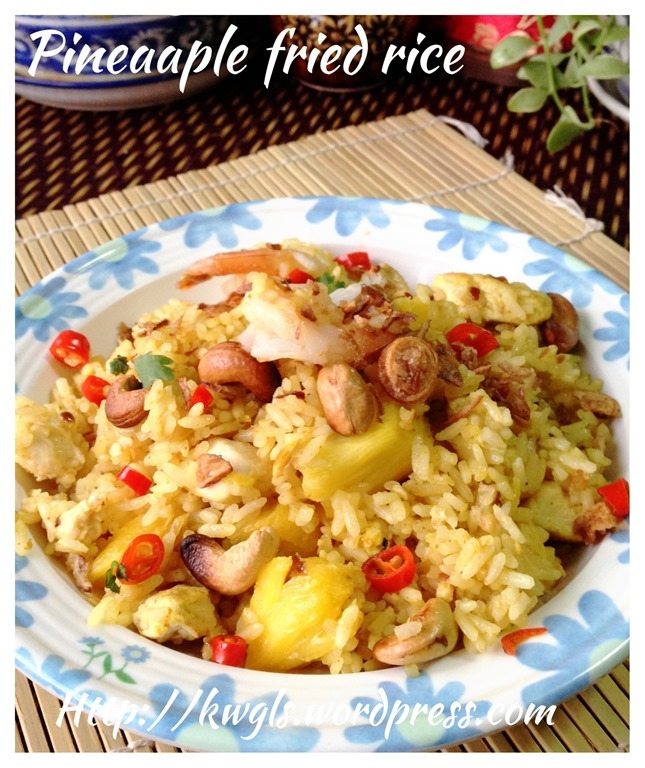 Therefore, though the rice looked grainy, it is not difficult to eat because of the pineapple juices that is sweet and aromatic. 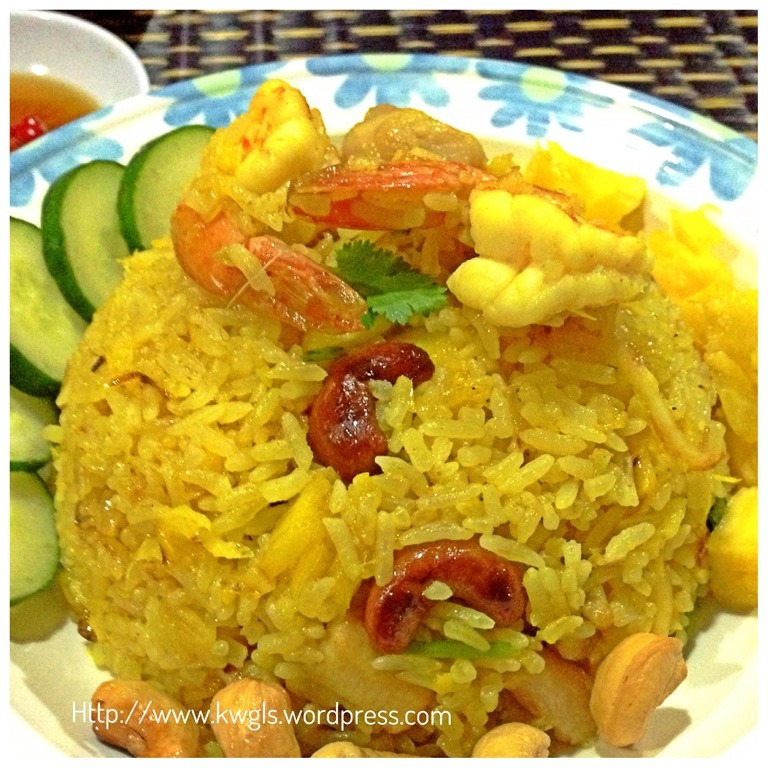 Most ingredients are optional including prawns, meat, meat floss, raisins and cashew nuts. 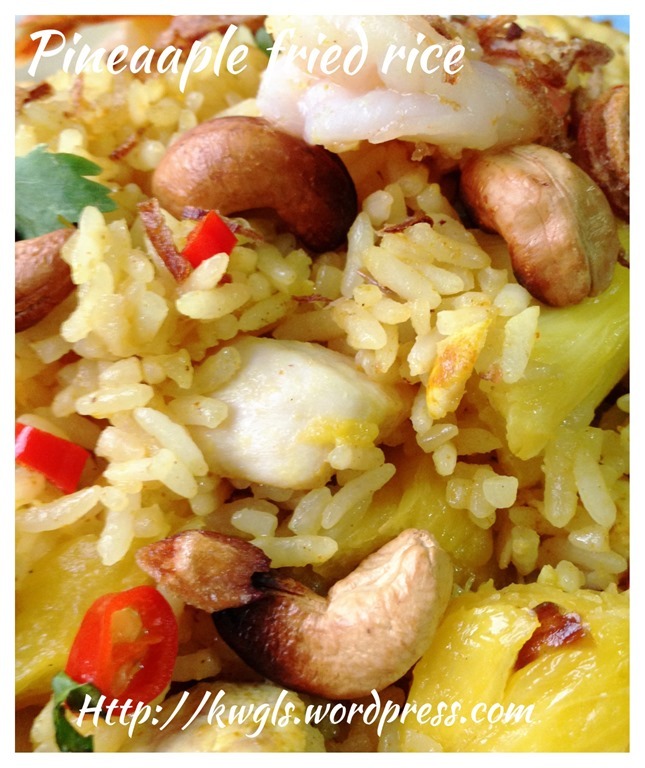 I have never eaten one pineapple fried rice that have exactly the same ingredients beside pineapple. 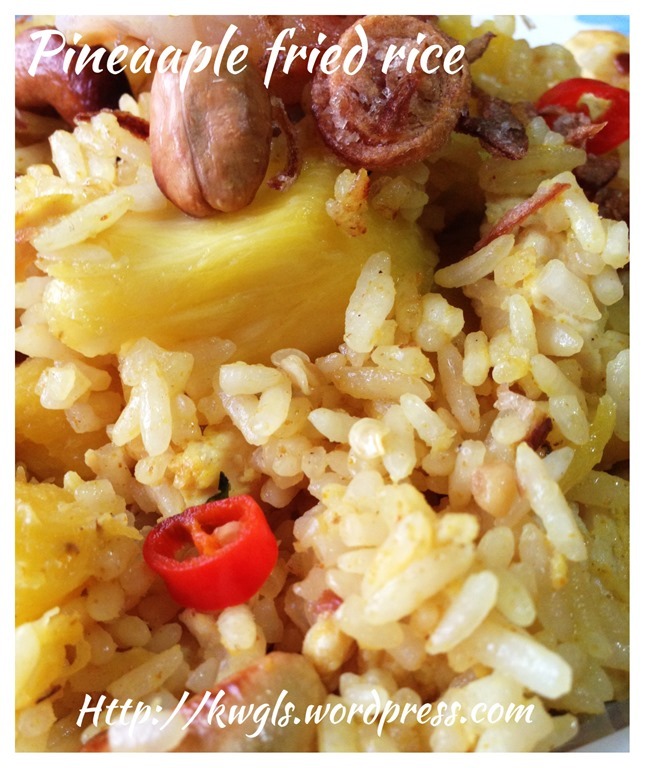 Feel free to modify yourself… Do you think all the fried rice in Thailand will have raisins and pork flosses…. as pork flosses are not considered as a local ingredient there..
Hope you like the post today and have a wonderful week ahead. 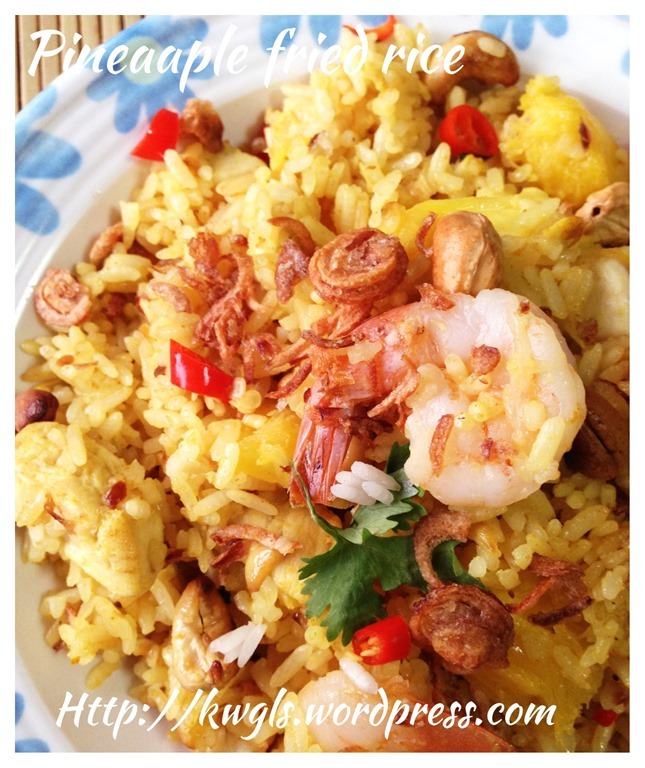 This entry was posted in Dish, Food Preparation Series, Noodles, Rice and Others and tagged 8, Cashew Nuts, fried rice, GUAI SHU SHU, Guaishushu, kenneth goh, Khao Phat Sapparot, PINEAPPLE, Pineapple Fried Rice, postaday, Thai Pineapple Fried Rice, thailand. Bookmark the permalink. I am so happy to be featured. Thanks Jamie. 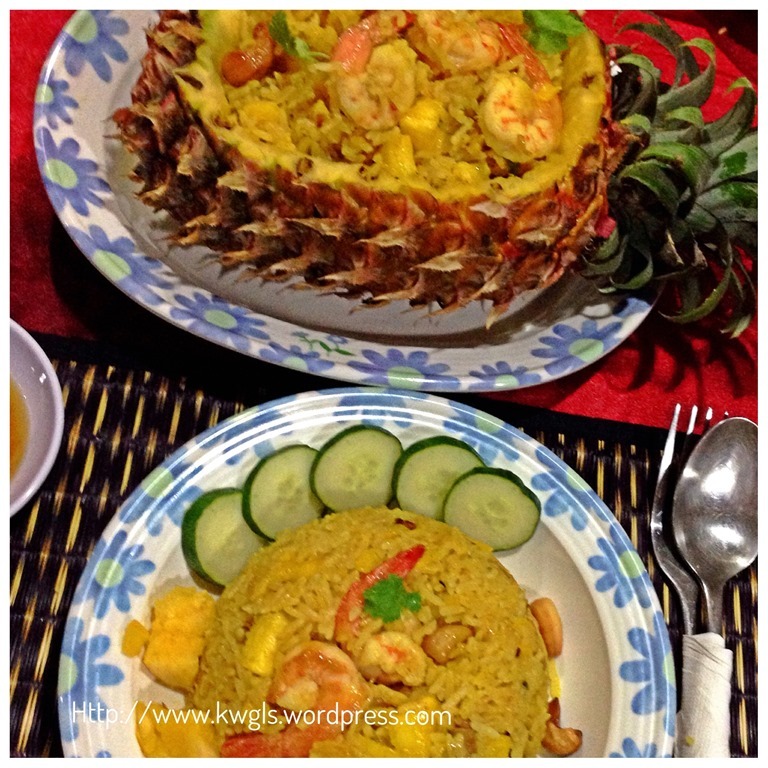 Hi Kenneth, This is Sandra from the Four Seasons Blog Hop. It is so very nice to get to know you and see your wonderful blog! This looks amazing and I love how you share your cooking knowledge with us with so many beautiful pictures. Another impressively striking dish. Amazing! This looks amazing! Headed over to pin it right now! Thanks for posting. 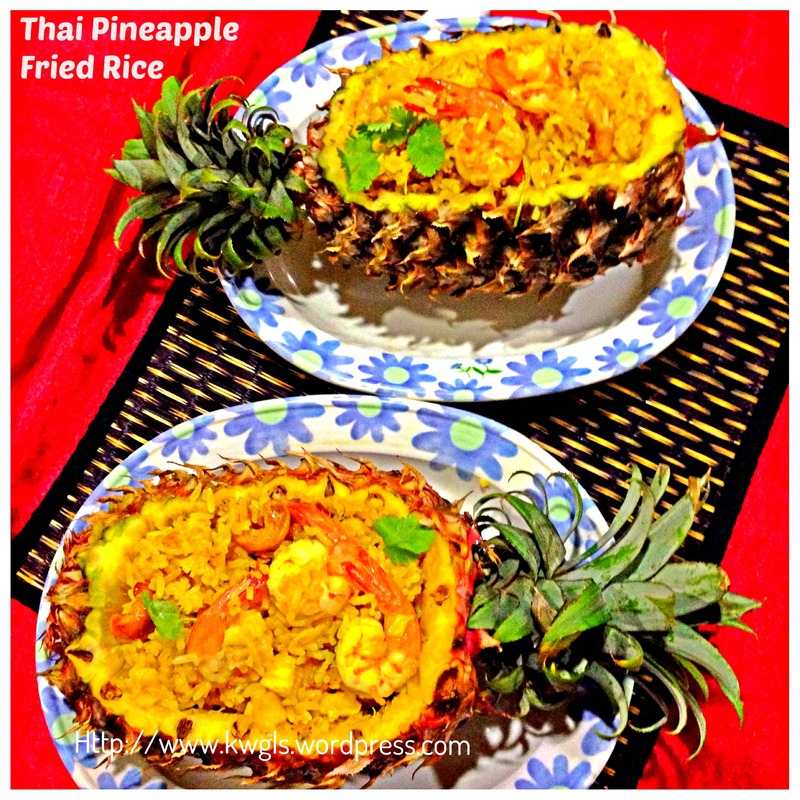 We used to get pineapple fried rice at a favorite Thai restaurant and loved it. When we moved out of state I tried to find a good recipe but nothing seemed quite right. This is perfect and looks and sounds exactly like what we loved. Pinning and trying very soon! This looks wonderful. 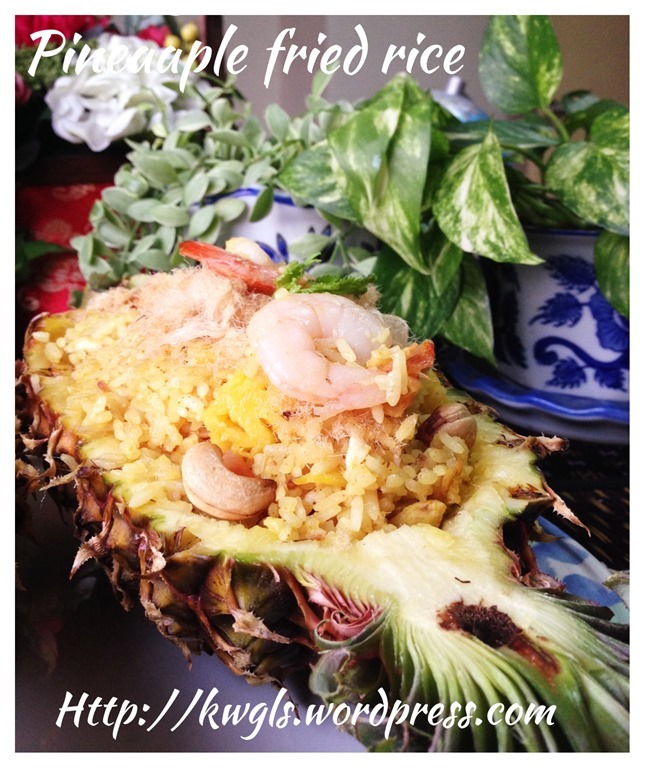 Pineapple Fried Rice is my husband’s ultimate favorite when we order Thai food. Thanks for the recipe!